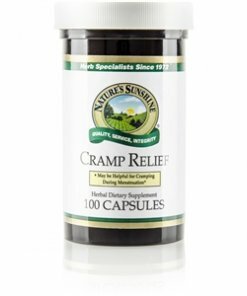 Nature’s Sunshine Cramp Relief blends herbs that alleviate muscle contraction and cramping during the menstrual cycle. With its unique blend of wild yam, black cohosh, cramp bark, lobelia aerial parts, and plantain leaves, Cramp Relief helps manage other menstrual symptoms including mood changes. It provides overall support to the female reproductive system. Instructions: Take two capsules two to three times daily with a meal.